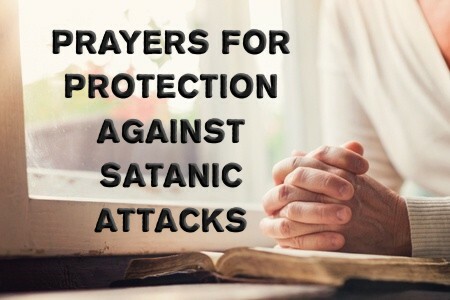 Here are five prayers you can use when you feel like Satan or his demons are attacking you. I know that You forgive all of our sins and cleanse us from all unrighteousness (1st John 1:9), but sometimes I believe the enemy or one of his demons can send waves of guilt at me. Help me to trust You in the midst of this guilt that is trying to rob my joy. I know that I have trusted in Christ and now there is no more condemnation (Rom 8:1), but the enemy sometimes whispers in my ear that I can’t really be a Christian because of the sin that I still do. Help me to fortify my faith by Your Word and give me that hunger and thirst to know You my Lord, and to expect that all who live for You will be under attack. I trust You to bring me home, so help my troubled conscious, as I ask for Your forgiveness, and restore the joy in my salvation, so that I might tell others about your goodness and that you give grace to the humble (James 4:6),and so it is in the strong name of Jesus I pray, Amen. I need the full armor of God to protect myself from the fiery darts of the enemy, because I am no match for the enemy without You and Your presence with me. Help me to keep the Word of God close to my heart so that I can know that You promise to never forsake me and never leave me, and You are faithful to Your own word, so help me to trust in You through Your word when I am feeling attacked. Father God, when these attacks come, send Your Spirit to remind me to focus on Jesus and that He has already had victory over the enemy and crushed all opposition to Your Kingdom, so let me trust in You, and fix my gaze upon Jesus, Who alone has brought the victory, so now I have no need to fear, and in the mighty name of Jesus Christ I pray, Amen. I come humbly before You and pray that You would glorify Yourself, even at my expense, and even when I am experiencing trouble in my personal relationships. Sometimes it feels like the enemy works through my employer or other people that are close to me, and that they may be attacking me because of them. Most of my family and co-workers know that I have trusted in You Christ, and this sometimes makes me a target at work and at family events. Help me to stay strong, even when I am treated unfairly, or when someone gossips about me and slanders my name. Please help me to hold my own tongue and be as Jesus was when faced with persecution and hostility. He never retaliated, so help me to not make matters worse when I am angered by some injustice done against me, like when someone’s told a lie about me. Help me to see that sometimes the enemy will use others to create difficulties in my relationships, so I pray that Your hand uphold me, even while everything seems to be in shambles, and in Jesus Christ’s name I pray, Amen. Sometimes I feel attacked in my inner conscience and I’m not always sure if it’s from You or if it’s from the enemy. Help me to know when it’s Your Spirit Lord, so that I can repent of my sin and confess it to you. When I feel condemned, help me to know that I’m no longer standing in condemnation. When I feel You’re angry at me, help me to see that I am trusting my feelings over what You reveal in Your Word. I know You are only angry at the sinner every day, but now, I no longer have Your wrath upon me because I have placed my trust in Jesus (John 3:36). What an amazing love You have for me, Lord, evidenced by Jesus’ supreme sacrifice, which You also had to suffer through. Help me to know whether You are convicting me of something and when You are prompting me to do something, or when it’s the enemy laying all of the worldly guilt upon me, which is not of God. Oh Father, I cannot always know without Your Spirit whether it is You speaking to me or it is the enemy, so give me discernment to know when it is You and when it is the enemy, and in the name above all names, the Lord, Jesus Christ I pray, Amen. I know that we are all fighting an invisible enemy that, alone, we are absolutely no match for. These wicked spirits are in high places and are sometimes part of the rulers in our land. Great God, help them to do what You would have them do so that we might have a peaceable life, in order that others would hear the gospel. There is coming a time, Lord, when we might not have the chance to openly speak about Jesus Christ in public. I pray that those now living in darkness in our community, who are blinded by the god of this world (2nd Cor 4:3-4), would have their eyes opened to receive the glorious gospel so that they might be saved. Let us fight on our knees Father, having in place the armor of Your righteousness that protects us from the wicked enemies. This dark, invisible enemy and his demons hate those who are Yours Lord, so help us to prepare ahead of time to ward off the weapons of the enemy, and to stay in Your Word to see that the enemy will eventually be vanquished (Rev 20:11-15). I pray this for Your Son’s glory in whose precious name I pray, Amen. If you tell me that you’re under attack, I’ll say, “Good. You must be doing something for Jesus.” I remember having a demonic attack in the middle of the night. It was scary, believe me. I immediately started praying Jesus’ name out loud and praising Him, and it finally went away. That was a first for me, and I have never forgotten it, but whether it was Satan himself or not, I don’t know. I doubt it because Satan goes after the big fish in the big ponds, not little fish in little ponds. Yes, it is possible, but since Satan is not omnipresent, meaning he can’t be present at two or more places at the same time. I doubt two people can have Satan attacking them at the same time on opposite ends of the earth. Only God is omnipresent (present everywhere). Satan is a created being and does not have this attribute and is limited by God by what he or his demons can do. Your best defense against spiritual attacks is to stay in the Word, memorize the Word, stay in fellowship with other Christians who will hold you accountable, and pray, pray, pray, like nobody’s business. If I’m not overstepping my bounds, what exactly was your demonic attack? I fear I may have had a similar attack, but I certainly did not react as you, or probably how I should have. Wow ..Thank you Jack for the Prayers,Please also pray for me to get a job that will help sustain my family and do the Lord’s work,Amen. Praying for you sir. Thank you for your kind words. You are so kind, but as we all know, all glory to God and to Him alone can I ascribe it to my friend. PS, I love the name Sanctuary House. I do not know that we need to ‘pray, pray and pray like nobody’s business’ given that the weakest sinner on their knees sends the devil trembling. This may be giving him too much credit? As Christians we have authority? I do agree about being in the word though. We should all be praying like nobody’s business! Prayer is a connection to God we should pray pray pray especially when under attack! And we do have do have authority over the enemy and his followers in Jesus name. My fiancé and I are under a very serious demonic attack. To the point of being tangible. I was chocked last. Ugly to the point of no breathing. I prayed in jesus’ name so hard and had so much fear but I knew Christ had power over all. Please pray for us and our family for we are going through tough times right now. We are told by Christ to praise his name out loud every moment so we are. Praise to our lord Jesus Christ! I too had a demonic attack in the middle of the night. I wasn’t alone and they felt it’s presence too. I knew that all I could do to save myself was to pray out loud in Jesus name. After, I felt a peace come over me that I can’t explain. First there was darkness then light. I don’t wish that fear on anyone. Jack , thank you for posting all these God Inspired prayers..
My Christian friend & I remind each other that God is in control of our lives & we must always Pray for His protection, of our minds & bodies. Since we share pages & prayers we find online, I will share your’s today. they are truly a BLESSING ! Where exactly in the Bible does God say that an angel can whisper into the mind of a Christian? Hello Mr. Cutshall and thank you question sir. There is no such Bible verse. God speaks to us through His Word, the Bible, and doesn’t need a angel to whisper in our ear. That is not from the Bible. If Satan is an angel, how can he whisper into my mind? Thank you Mr. Cutshall. Why cannot Satan whisper. Angels can speak, as with Michael and Gabriel, and even Satan (Job 1). Satan can whisper into our minds but he cannot read our minds. There is no evidence of this in the Bible. Yes, Satan can talk. But only audible. Putting a thought into the mind, just no evidence. The only way to my mind for Satan is through my ears. Or my eyes, if I read. Inside of me is the Holy Spirit, he brings to my mind what he thinks is important for me. Also, inside of me is my carnal nature. Our carnal nature is the unrighteousness that God wants to cleanse us from. 1John 1:9 God calls this process sanctification. It is the inside war. Galatians 5:16-17 The other war we have is the outside war. God has given us the ministry of reconciliation. Helping the children of Satan to become children of God. Thank you for listening and responding. I have been confused about Satan for a long while. Thank you Mr. Cutshall for your great contribution. You have added some important things to this article sir. please pray for my sister having trouble with her husband because of third party.. for restoration.. Previous post: How Do Christians View Human Cloning? Next post: What Is The Didache? Is It Inspired By God?